The Avondale Swim and Tennis Club is located in historic Avondale Estates, Georgia. It’s a private community pool and tennis courts established by and for Avondale Estates residents, who have swum and played there since its creation around 1927. Mr. Willis described the pool as being “set like a precious gem in a grove of patriarchal oaks.” When Avondale Estates was still known as Ingleside, the watering hole was called “Ice Cream Springs” because of the cool water springs located under Dartmouth, at or near the present entrance to the pool.Mr. Willis, enamored with the area, chose it as the site. By 1925, construction was underway for the pool, 107 feet long, 49 feet wide, and varying in depth from 2 1/2 feet to 11 feet. The spring supplied water for the pool, except when it was cleaned. Then, it would be filled halfway with water from the county, and the remainder with spring water. The pool was filled and drained several times before painters struck upon a color that would tint the water to Mr. Willis’ satisfaction. My dad was president of the pool in 1952. Membership was still $10.00 at that time, he tells me. The first Avondale Swim Team began in 1955. We were a AAU-affiliated team and traveled all over the Southeast to compete. In 1956, the first Dixieland Championship was held at our pool. We held a 3-day event hosting about 1000 swimmers from 40 or 50 teams from all over the Southeast and beyond. Wooden bleachers were brought in and placed on top of the shuffleboard courts to hold all of the spectators. We could not have the diving competition at our pool because we didn’t have a 3-meter diving board, so that part of the meet was held downtown at the old Heart of Atlanta hotel. Avondale hosted the Dixieland Championship for a period of about 8 or 9 years, I believe. 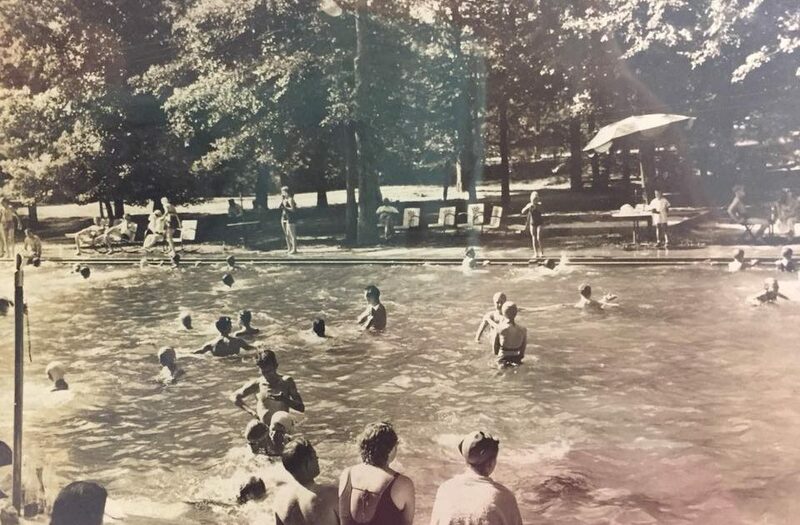 With the success of the Dixieland swim meets and the advent of modern technology, the pool was completely renovated in 1958 for the first time. The deep end was lowered to a depth of 11 feet, and pumps and a filtration system were added. A newer concession stand was built, which today is our gatehouse, and the patio was added. We’d play ping-pong and shuffleboard or hang out in the dance hall whenever we weren’t in the pool playing dipple dapple or corner tag or swimming that mile a day we were required to do if you were on the swim team. The concession stand sold treats by the dozens. A candy bar cost 6¢ and a large drink was 11¢. Our folks had a credit arrangement with the manager of the pool. Each family had an index card with their name on it and we had about $1.00 worth of credit per week. At least, that’s what I was allowed! In 1962, Milton and Lee Shelnutt moved back to Avondale, thank God, and Milton was on the pool board by 1963 and has served us well ever since. Milton said the dues were $35.00 when he was president of the pool in the mid-60’s. 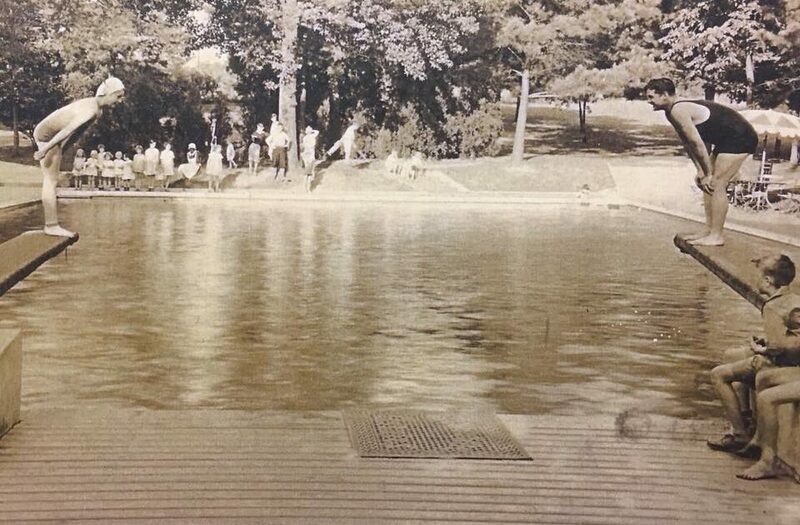 The baby pool was added in the mid-60’s. In the mid-70’s the existing pumps were installed and the existing bulkhead was built right there at the pool by hauling in a 55′ steel i-beam that a couple former board members designed, and welding that thing together, much to the amazement and entertainment of every 12-year-old boy in town. My brother was president of the pool around 1974. Dues were up to a whopping $150.00 by then. The newer private tennis courts were added during the 70’s, and of course, many of you have seen the progress of the 80’s and 90’s with the addition of the walkways out front, the beautiful landscaping, and the electrical and bathhouse renovations. You know, we used to have to borrow money every year to get the pool open for the summer. There were many years when we only had about $200 to $300 in the bank at the beginning of the season, but I think we can all agree that there is no better place to be with our friends and families than at the Avondale Pool, whether it’s playing with our kids in the baby pool, going for a refreshing swim, or enjoying some of the social functions provided by the pool such as the ice cream socials, the adult parties, or those classy Sunday brunches. The Avondale Swim and Tennis Club is a vibrant part of our community, and speaking personally, there have been 5 generations of my family who have enjoyed it for almost fifty Summers now, and I certainly hope that we can continue to provide those fun Summer days of being “down at the pool” for all of Avondale for many generations to come. ©2005 by Pat Frontier Maddox, all rights reserved. Photos courtesy Pat Frontier Maddox.